Ward 5 residents register at North Community High School on April 4, 2017. Photo by Uche Iroegbu. 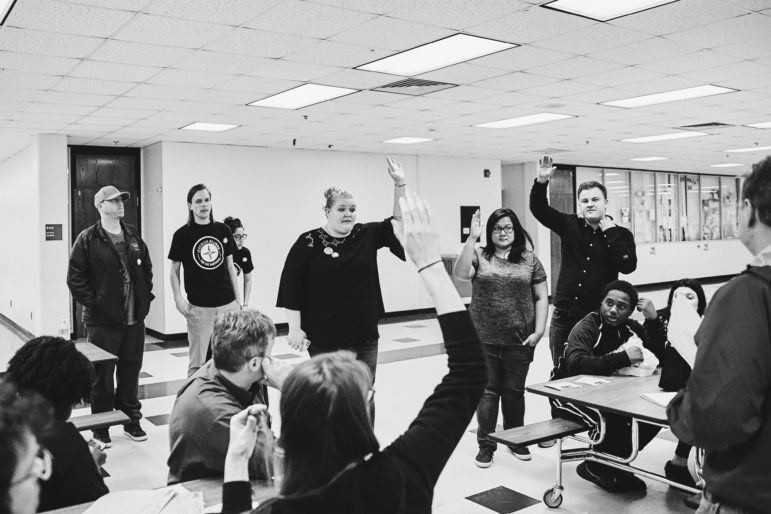 On April 4, residents from across the city arrived at high schools and recreation centers for Minneapolis’ 2017 DFL caucus. 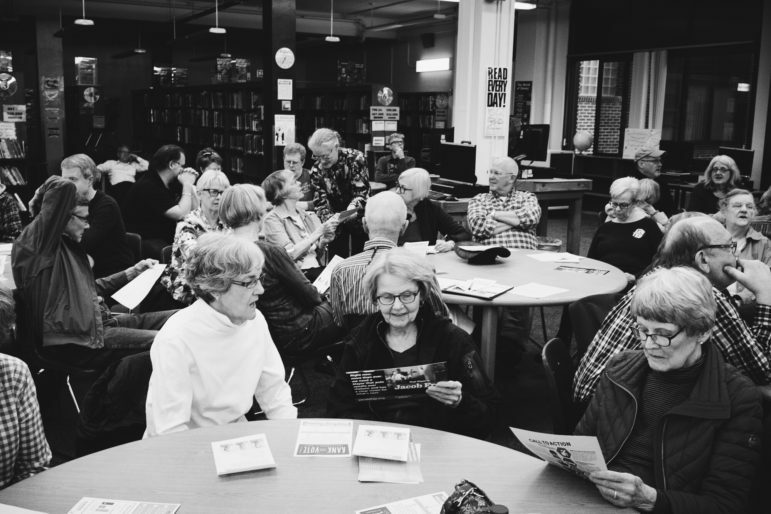 They came in support of candidates for mayor, Minneapolis Park and Recreation Board, City Council and even the Board of Estimate and Taxation to decide who would get the benefit of the DFL political machine this November. Caucusing can be messy. For the uninitiated, the rules can feel arbitrary and archaic, the proceedings raucous and divisive. And even in 2017, questions on equity in the party still linger. In the DFL, the delegations that go on to party conventions must make their best effort to represent men and women equally – however the party has no quota on indigenous delegates, delegates of color, or delegates who identify as a non-binary gender. 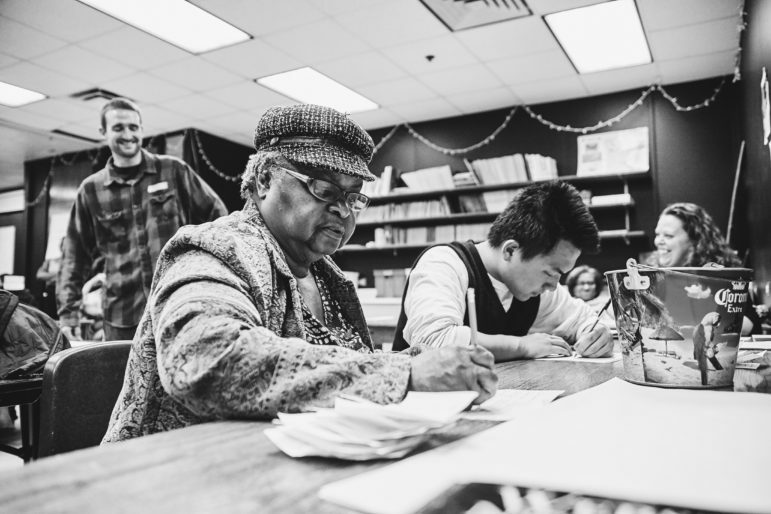 But in classrooms and cafeterias, caucuses can also be democracy at work. Resolutions to support a $15 minimum wage, or to demand more racially equitable party policies circulated among the crowds. In Ward 9, some precincts reported turnout more than 150 percent higher than in 2013. 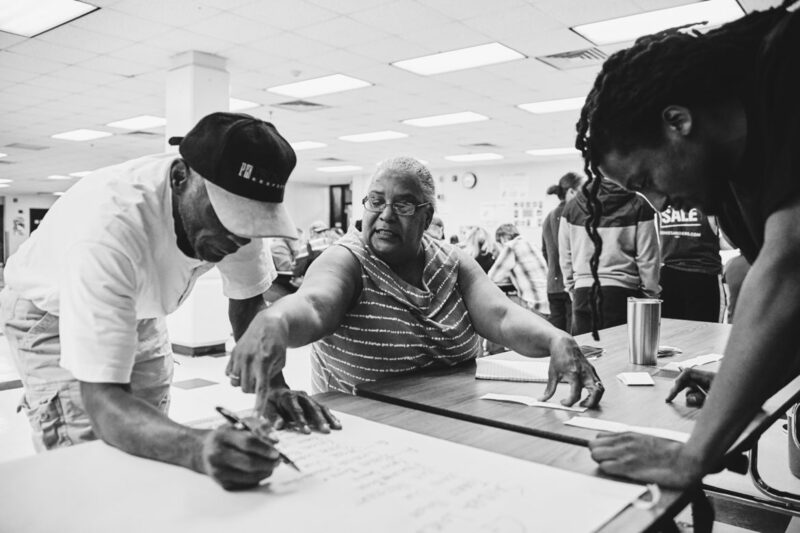 In these photos, captured by Uche Iroegbu in Ward 5 and Annabelle Marcovici in Ward 12, catch a glimpse of caucusing – of Minneapolis’ infamous levels of civic engagement – in action. 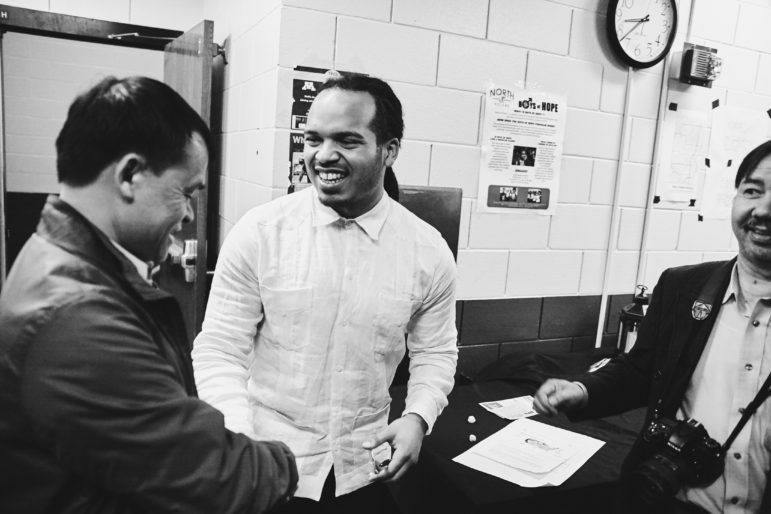 Ward 5 City Council candidate Jeremiah Ellison (center) speaks with Northside residents. Photo by Uche Iroegbu. 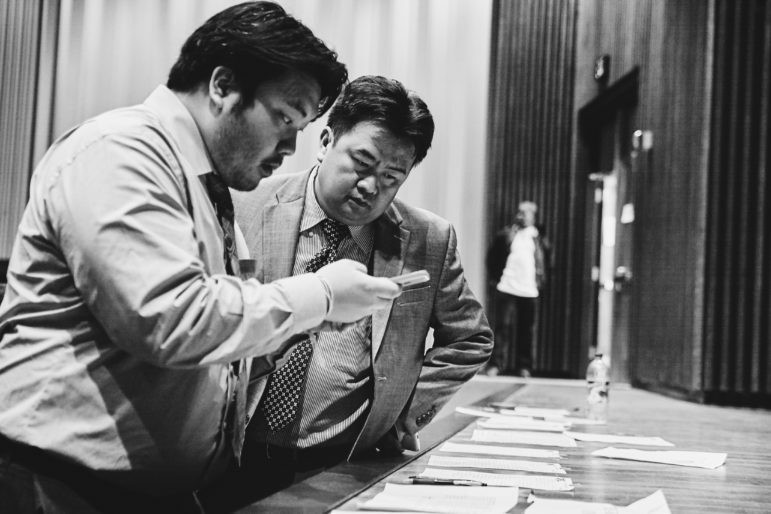 Ward 5 City Council Member Blong Yang (right) reviews lists of delegates. Photo by Uche Iroegbu. Caucusing in Ward 5. Photo by Uche Iroegbu. 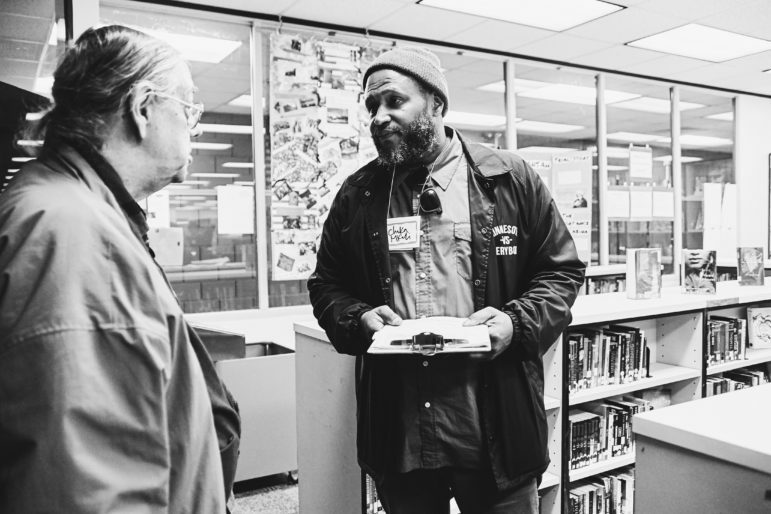 Organizer Chaka Mkali (right) speaks with a Northside resident in the library of North Community High School. DFL volunteers take a tally at the Ward 5 precinct caucuses at North Community High School. Photo by Uche Iroegbu. 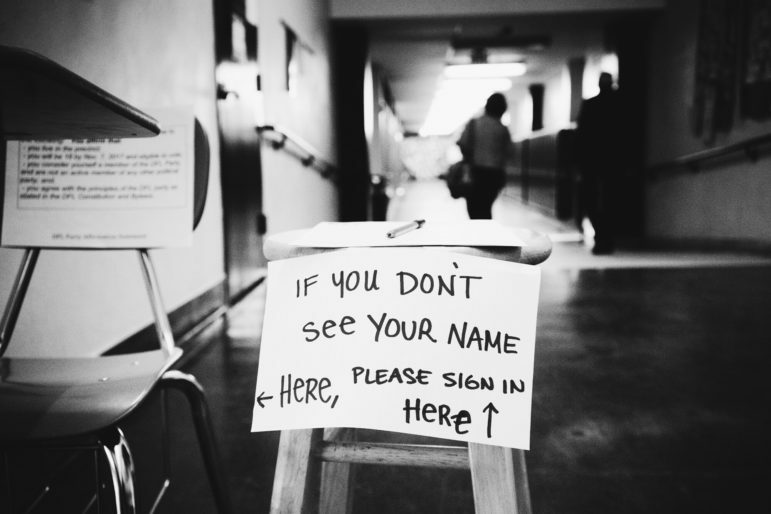 Sign-up sheets outside the Roosevelt High School classrooms where Ward 12 caucuses were held. Photo by Annabelle Marcovici. 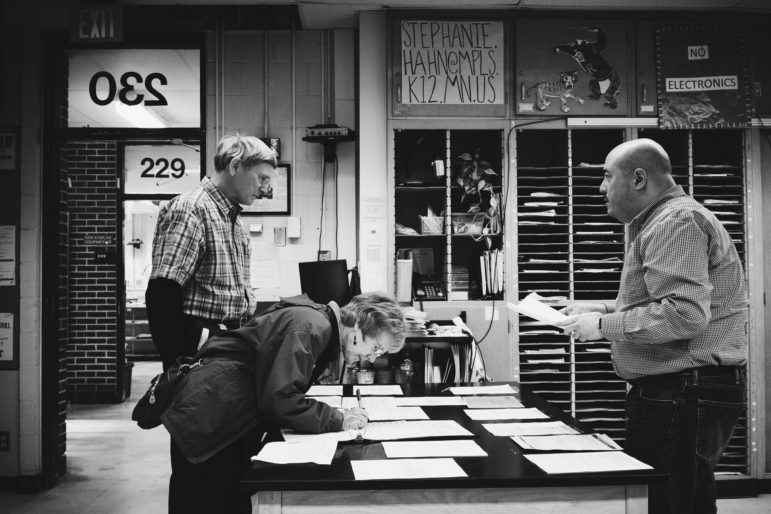 Ward 12 residents sign into their precinct’s room at Roosevelt High School to caucus. Photo by Annabelle Marcovici. 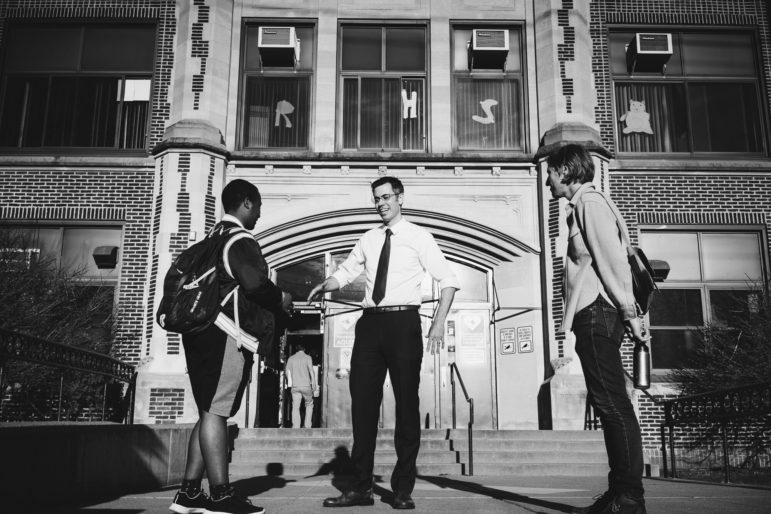 Ward 12 City Council Member Andrew Johnson greets caucus-goers outside Roosevelt High School. Photo by Annabelle Marcovici. Volunteers with Al Flowers’ mayoral campaign canvass Ward 12 caucus-goers. 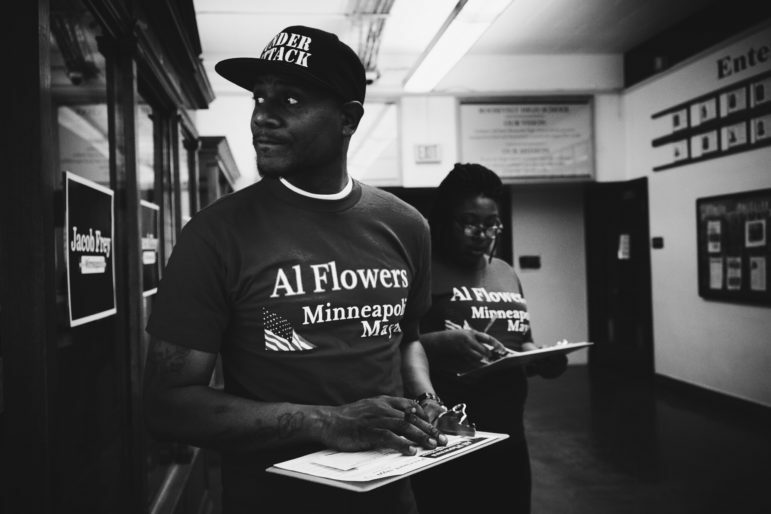 Flowers was brutally attacked by Minneapolis police officers in 2014 when he asked them to show a warrant for his daughter’s arrest. Photo by Annabelle Marcovici.